Open to everyone. Admission: Members £2; Non-members pay £3. All welcome (CAFG invite contributions of 50p). Marilyn Palmer has been a leading figure in the study, recording and advocacy of industrial archaeology for many years, and became the country’s first Professor of Industrial Archaeology in 2000. Members £2 Non-members £3. Refreshments Available. Members of the public are welcome to attend, entrance is £2 for non-members. John Clark joined the staff of Guildhall Museum (City of London) in 1967, and worked on the project for its incorporation with the London Museum to form the Museum of London in 1976. As well as contributing to the design of the Museum of London’s first medieval gallery and overseeing the amalgamation of the two museums’ medieval collections, he also initiated and supervised the digitisation of the Medieval Department collections database. John also carried out various projects focused on updating the medieval gallery, particularly the Anglo-Saxon London displays, and produced a number of temporary exhibitions, including ‘Alfred the Great 849-899: London’s forgotten king’ and ‘Chaucer’s Londoners: “a compaignye of sondry folk”’. A warm welcome to the brand new Jigsaw Cambridgeshire website. 'Jigsaw - Piecing Together Cambridgeshire's Past' was a Heritage Lottery Funded project, designed to support and develop community archaeology in Cambridgeshire. The project ran from September 2011 until October 2016 and was a joint venture led by Oxford Archaeology East and Cambridgeshire County Council, with other partners including Huntingdonshire District Council and the Council for British Archaeology. The key legacy of the Jigsaw project has been an active network of skilled volunteers and community groups across the county who are now able to engage and participate with their local heritage group. The Jigsaw community is continuing beyond the life of the HLF funded project, with OAE commited to supporting Jigsaw affiliated community groups into the future. With this in mind, we have re-developed our website and hope it will continue to prove useful and interesting to anyone wanting to learn more about their historic environment. OAE are also continuing to manage the community resource of equipment and guides and the Jigsaw social media accounts on Facebook and Twitter. Jigsaw has been a ground breaking archaeology project, widely praised within the wider archaeological community and was shortlisted by the CBA in the 2014 British Arhcaological Awards for the Best Community Engagement Archaeology Project. We aim to continue helping more people to get actively involved in discovering, understanding and protecting their own local heritage. If you want to affiliate your community group with Jigsaw to make the most of our free resources, to create or join a new Archaeology Action Group, or to find out more about archaeological volunteering please contact us. We have a new artefact identification guide to add to the thirty-two existing Best Practice Users' Guides produced by Jigsaw. 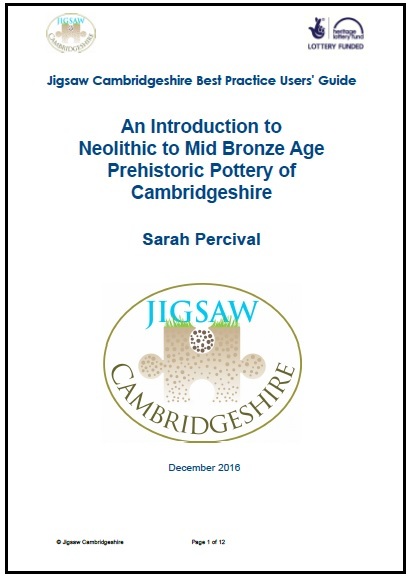 'An Introduction to Neolithic to Mid Bronze Age Prehistoric Pottery of Cambridgeshire' has been written by Oxford Archaeology East's prehistoric pottery specialist Sarah Percival and complements the 'Late Bronze Age and Iron Age Prehistoric Pottery ' guide written by OAE's Matt Brudenell. Both guides cover the most common pottery types from the prehistoric period in Cambridgeshire. They do not cover all pottery types found, or in any great detail, but we hope you find them useful to give a good general overview of the types you are most likely to find when excavating in Cambridgeshire. More artefact identication guides can be downloaded for free from our online Guides pages. 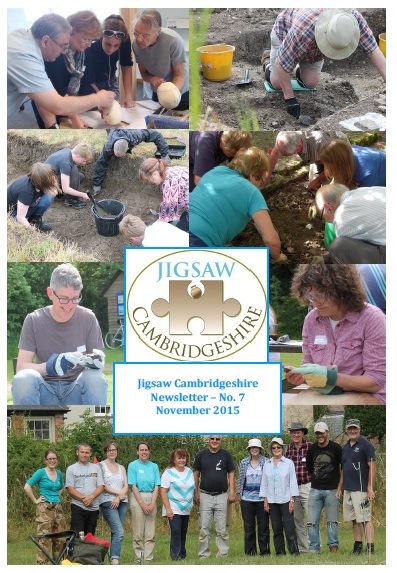 The seventh Jigsaw Cambridgeshire newsletter is available to download.